Low Water Immersion dyeing is also known as "scrunch" dyeing, "crumple" dyeing, or "crackle" dyeing. In traditional immersion dyeing, one uses a large volume of water, frequent stirring, and the use of leveling agents such as salt and, optionally, Calsolene oil, in order to make the color as smooth and featureless as possible. Low water immersion dyeing is the opposite of this approach. In low water immersion dyeing, one uses as little water as possible, crunching the fabric together for a sort of resist effect, with as little stirring as possible. Wonderful color gradations are the hallmark of the low water technique. Where mixing opposite colors, such as red and green, result in ugly muddy effects in tie-dye, they result in gorgeous subtle shadings in low water immersion dyeing. The reason for this is that, in tie dyeing, one normally pre-soaks the fabric in the soda ash fixer, or else adds it to the dye solutions themselves, so that the dye immediately reacts with the first fiber it touches. There is no chance for the dye colors to blend before the reaction takes place. In contrast, the low water technique involves adding the fixer *last*, after allowing the colors to slowly blend and creep along the fabric, resulting in truly infinite gradations of color. For pictures of examples, see the low water immersion section in my gallery. As in other forms of hand Procion MX dyeing, study the How to Dye basic recipe first. Make sure you have all the chemicals and supplies you need for dyeing: Procion MX dyes or other fiber reactive dyes, sodium carbonate, thin rubber or plastic gloves, measuring cups and spoons, dust mask for measuring out dyes, and a small bucket, large jar, or other container for doing the dyeing in. (The container should be plastic, glass, enamel, or stainless steel, not aluminum or iron.) The container should be no wider than necessary to hold the fabric, as it is best to really cram the fabric in tightly, for maximum contrasts. Be sure to pre-wash all clothing to remove invisible finishes that can prevent the dye from getting to the fabric. My technique is slightly different from that described in Ann Johnston's wonderful book, Color by Accident- you should find your own techniques evolving with experience - primarily because I lost her book for a year, but had enough memory of its main points to inspire me to try, anyway. I also prefer not to work with the dye stock solutions she uses, but instead mix new colors as I need them, and I prefer not to add any fixer until after all of the dye has been added. Applying dye. First, crumple the garment or cloth and stuff it tightly into a container. Then mix up one color of Procion MX or similar fiber reactive dye, anywhere from 1/16 to 4 teaspoons of dye per cup, total volume one to two cups (where a teaspoon is about 5 ml, and a cup is about 250 ml). Do not add urea - you want nothing but pure dye in water. It may take five or ten minutes of constant stirring to dissolve some dyess. Pour this over the garment. You may choose to pour a cup or two of plain water over in between adding different colors, or you may choose to put one color in the bottom of the container (having first checked the fit with the dry garment in the clean container) before adding the clothing, and pour another color over the top. You can also use only a single color, especially if it is a mixture of dry dye colors so that the colors will tend to separate out as they creep along the fabric. Keep track of how much water you add, total, for the next step. Do not stir or mush the fabric at all in this step, unless you wish to mute the variations in the final piece. Fixing the dye. When you have left the dye to rest long enough, you can now add the fixer. This is the same sodium carbonate, or soda ash, used in the other recipes in this site. A good concentration to use is one teaspoon (5 ml) for each cup (250 ml), total volume, in the dye bath - including whatever amount of water you will be using to dissolve the soda ash in for adding it. Soda ash dissolves best in warm water, about 95°F (35°C). If you have used a total of 8 cups of water in your dye bath, then, use 9 teaspoons, or 3 tablespoons, of soda ash, dissolved in an additional cup of water. Gently pour this soda ash solution over the top of the dye bath. I add more water if the topmost bits of fabric are still sticking out of the liquid, at that point. I do not stir or agitate the mixture in any way. Reaction Time. You must then leave the soda ash to react with the fabric and dye for a miniumum of one hour. Some prefer to "batch" the reaction for 24 to 48 hours. I have never found this added time to be necessary, though I will leave the reaction overnight when that is more convenient for me. I believe that "batching" is an attempt to make up for low temperatures in the reaction, caused by low room temperature. If your room is cold, it may be more useful to warm the reaction (*after* adding the soda ash, not before, as dye will quickly react directly with hot water, leaving none to react with the fabric) than to leave it for long periods of time. Experiment with this for yourself. Salt. Some dyers prefer to add salt to their low water immersion dyeing, to increase depth of shade and/or patterning; others, including Ann Johnston, do not. Only trial and error can tell you which you prefer. You can use one teaspoon (5 ml) per cup (250 ml) of total water volume. Do you still need more details? Buy or borrow Ann Johnston's book, "Color By Accident" - see the Book Reviews page—or see the immersion dyeing links on my page of Links to Other Informative Sites. 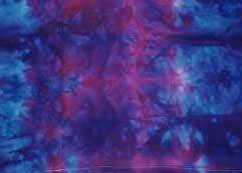 You can also read an article by Joyce White Vance, entitled Crackle Dye on Fabric, with instructions for her approach to low water immersion dyeing.